Yes, Cultured Cowboy is a Western Store. 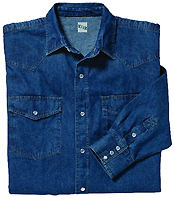 But, did you know that much workwear is sold in Western stores? Maybe that's because of the great numbers of farmers and ranchers that need work clothes and boots. Even "city slickers" have joined the "work fashion" craze. 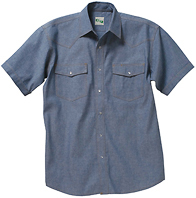 Seems like everybody is familiar with Wrangler, Levi & Carhartt; but you know, Key Industries is one of the largest suppliers of quality work coats, work shirts, and bib overalls, in this world? Wear Tested for 100 years. The fit is relaxed enough that you can work without restrictions. Reinforced everywhere! Key, and their co-brands of Lakin McKey, Polar King, Wolf Mountain, and Tuff Nut, are worldwide, and priced for the real world of welders, farmers, and construction workers. The finest fabrics in both blends and 100% of cotton, polyesters, and heavyweights, mid-weights, water resistant, ... almost anything you want! Tough enough, and still not scratchy, nor stiff. Notes: Sizes are pretty true. If you are working and kinda between sizes, guess big. You can use a fabric water repellant on all the denim and duck materials. Any "Scotchguard" type product will work. We offer a great product, M&F Water & Stain Protector. Only $4.99. Click here for the 507.45 larger detail page. 5 1/2 oz. 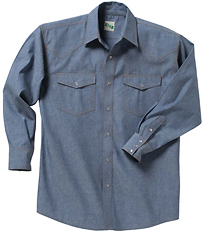 100% cotton chambray material. Wears comfortably, cleans easily. Lasts a long time! Double needle stitching. Bone buttons. Matching thread in stitching. 2 chest pockets with mitered flaps. Pleated back yoke for easy reaching. Pencil slot. Banded collar. Collar stays. Click here for the 5007.45 larger detail page. 5 1/2 oz. 100% cotton chambray material. Wears comfortably, cleans easily. Lasts a long time! Double needle stitching. Pearl snap closures. Common jean thread in stitching. 2 chest pockets with mitered flaps. Front & rear Western yokes. Sleeves cut on circle for easy movement. Slightly tailored fit. Pencil slot. Banded collar. Collar stays. Click here for the 336.__ larger detail page. 5 1/2 oz. 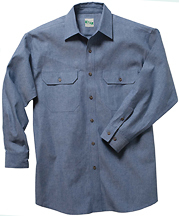 100% cotton chambray material. Wears comfortably, cleans easily. Lasts a long time! Double needle stitching. Bone buttons. Matching thread in stitching. 2 chest pockets with mitered flaps. Pleated back yoke for easy reaching. Pencil slot. Banded collar. Collar stays. Doghouse sleeve placket. Double button adjustable cuffs. Button on sleeve vent. Click here for the 35.__ larger detail page. 5 1/2 oz. 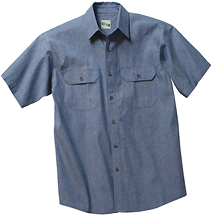 100% cotton chambray material. Wears comfortably, cleans easily. Lasts a long time! Double needle stitching. Pearl snap closure. Common jean thread in stitching. 2 chest pockets with mitered flaps. Front & rear Western yokes. Sleeves cut on circle for easy movement. Slightly tailored fit. Pencil slot. Banded collar. Collar stays. Doghouse sleeve placket. Double button adjustable cuffs. Button on sleeve vent. Click here for the 310.__ larger detail page. 8 oz. 100% cotton denim material. Wears comfortably, cleans easily. Lasts a long time! Double needle stitching. Top button, 7 Pearl snap front closure. Common jean thread in stitching. 2 chest pockets with mitered flaps & snaps. Front & rear Western yokes. Sleeves cut on circle for easy movement. Slightly tailored fit. Pencil slot. Banded collar. Collar stays. Snap closure doghouse sleeve placket. Snap on sleeve vent. Click here for the 376.__ larger detail page. Click here for the 372.__ larger detail page. Insulated Hooded Duck Jacket – Water & Stain Repellent Finish. 100%mid-weight duck. Heavyweight bonded polyester fiberfill insulation. Black taffeta lining. Recessed dyed-to-match knit storm cuffs with black taffeta facing. Antique brass front zipper. Bar tacked stress points. Pleated back for easy reaching. Pleated elbow on a two piece sleeve for easy moving. Two lower pockets with fleece lining. Two interior pockets with Velcro closure. Three-piece fleece lined hood with drawstring for fit. Triple needle stitching. Locker loop. Firm Hand. Insulated Duck Chore Coat – Water & Stain Repellent Finish. Click here for the 378.__ larger detail page. 100%cotton mid-weight duck. Heavyweight bonded polyester fiberfill insulation. Black taffeta sleeve lining. Recessed dyed-to-match knit storm cuffs. Antique brass hardware. Pleated back for easy reaching. Pleated elbow on a two piece sleeve for easy moving. Two lower front pockets with fleece lining. Two top entry pockets on chest, one with a concealed snap closure. Pencil pocket on left chest pocket. Two interior pockets with Velcro closure. Triple needle stitching. Locker loop. Firm Hand.